THE BEST CHOCOLATE CHIP COOKIE!! 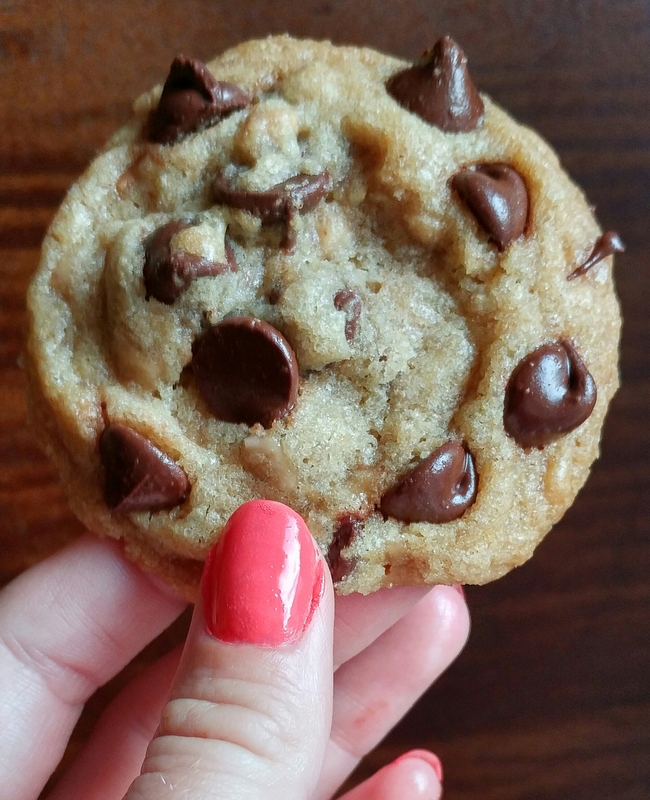 It’s a common question– how do you make the perfect chocolate chip cookie? Butter or shortening? How much brown sugar vs. granulated sugar? Do I use more than one type of flour? There are so many factors! Well, consider your questions answered! If you want a soft cookie with the perfect crispy edges; a subtle buttery dough; and exploding, gooey chocolate flavor, keep reading!! 1) First, let’s brown the butter. Unwrap the 2 sticks of butter and put them in a heavy-bottomed sauce pan (aka, a pot). Place over medium heat and whisk constantly. The butter will boil and continue to bubble. Whisk constantly until you juuust start to see the yellow butter turn a light brown. Turn the heat off, remove the pot from the stove, and keep whisking. It’ll take on a full, dark brown color. Pour into a different container, cover, and refrigerate. 2) In the meantime, in a different medium-sized bowl, whisk together the flour, baking soda, and salt. Set aside. 3) In the bowl of a stand mixer, measure out the brown sugar and granulated sugar. When then butter is no longer hot to the touch, add that in. Make sure to get all the brown bits that settle to the bottom of the bowl. Beat the butter and sugars on a medium/high speed. When they’re fully combined, add in the eggs and vanilla. Mix again on a medium speed until the mixture is a creamy pale color. 4) With the mixer on a low speed, gradually add in the flour mixture. When there are just a few flour streaks left, add in the toffee and chocolate chips. 5) Using a spatula or wooden spoon, hand-mix the dough to make sure everything is combined. Cover the bowl so that it’s airtight and refrigerate it for at least 1 hour. Overnight is great too. 6) When you’re ready to bake, preheat the oven to 325 degrees. Line cookie sheets with silpat mats. Using a small cookie scoop (or two teaspoons), scoop the dough out onto the cookie sheets leaving about 1 inch between each dough ball. Bake for about 9 minutes, or until the edges juuuust start to brown. Nom. Cool for about 5 minutes on the cookie sheet and then transfer the cookies onto wire cooling racks. Repeat using all of the cookie dough. Try ’em out! What do you think? ?